None of those sensations contributes to a positive user experience. In fact, all of them detract from it. And it’s true. The same modal that sends me into a roaring fit of rage might very well garner more conversions for some brands than before they started using it. So. What are UX-friendly brands to do? They want to maximize conversions, but they also want people to love using their website. Don’t confuse correlation with causation: Just because you’ve increased conversions since adding the modal doesn’t mean the modal is the reason for the increased conversions. 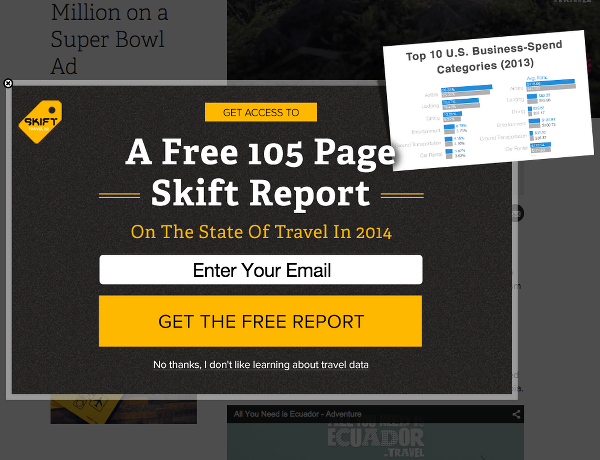 Was the uptick in conversions a direct result of the modal, or was it something else? Test, analyze, and test some more: Maybe you are getting more conversions from the modal, but is your bounce rate up, too? Check and see. What could you do instead of interrupting a user’s content consumption that might encourage that person to convert? Try that instead, and compare the results. Experiment with your modals: An exit overlay may have a different effect than the one that appears halfway down the page, in the middle of a user’s reading experience. Try it. See what happens. A/B test using different copy. Use different language with different modals depending on when the window appears. If you’re going to insist on interrupting the user’s experience, you had better be able to justify it. If the data indicates that your modal is justifiable, so be it. But if it doesn’t, it’s time to try something else (or nothing else). Dead set on using an unsolicited opt-in modal? Avoid snarky opt-out copy. You don’t want to make the user feel like a loser for not engaging with your brand. 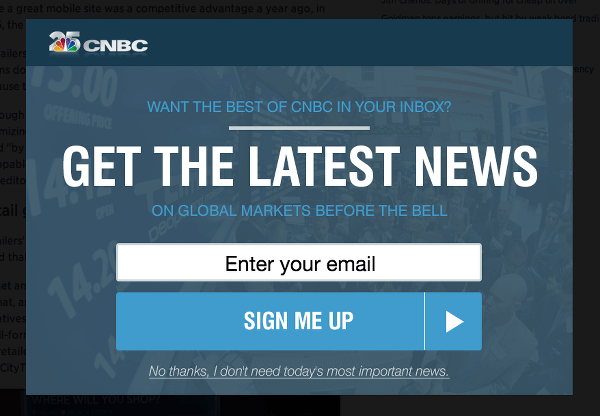 Thanks, CNBC, for forcing me to lie to you about my news consumption habits (I do care about today’s news, thank you) just so I can bypass your newsletter and continue reading your article. If you’re getting passable results from a modal opt-in but want to up the ante, seriously consider using “nice” copy for the opt-out link. If Copyhackers’ tests are any indication, an opt-out link can increase conversions as long as the copy doesn’t offend your reader. If you’re even on the periphery of the user experience design scene, you’ve almost certainly encountered the word “empathy” in relation to UX practice. The basic gist of the empathy/UX design association is that designers should go beyond merely understanding users to actually sharing in those users’ feelings. As a result, a designer will provide a more ideal experience for all of the personas to whom he or she is designing. 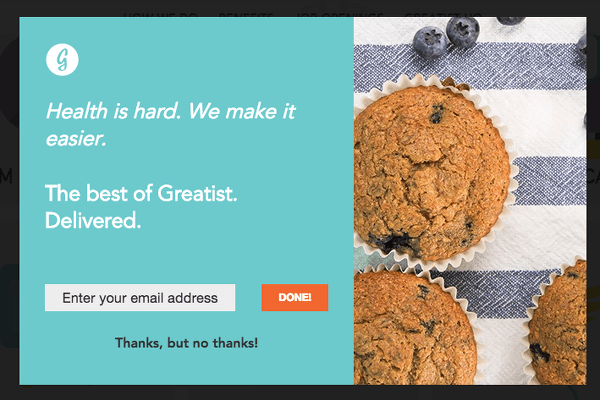 With that notion in mind, here’s a question: How empathetic is an unsolicited modal window? Answer #2: Possibly sufficiently empathetic under certain conditions, although we’d have to run some tests to know for sure. I actually think both answers are correct, which isn’t very encouraging. Here’s another one: How empathetic is a modal window that has the audacity to command me to subscribe to a newsletter within two seconds of my landing on a website for the very first time – even though I’ve never interacted with this brand before in my life? It’s not a trick question, and we’ve all encountered “those” modals before. Too often, modals have become a hack to avoid thinking about content placement. In some cases, they reflect poor judgment and thoughtlessness on the part of developers, who see them as a gift of newfound space, an easy out. In other cases, last minute requests for additions, coupled with a lack of technical skill or resources to edit or pare down existing page content can be the underlying motive for creating a modal. […] Regardless, brands, content managers, and developers need to put more thought into when to use modals, and when to leave them out. I especially like the “leaving them out” part. Wait! 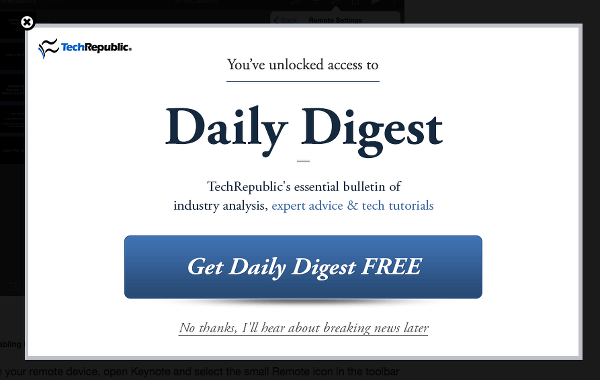 Aren’t modal windows better than popups? Is falling out of a tree that’s forty feet tall better than falling out of a building that’s forty stories high? 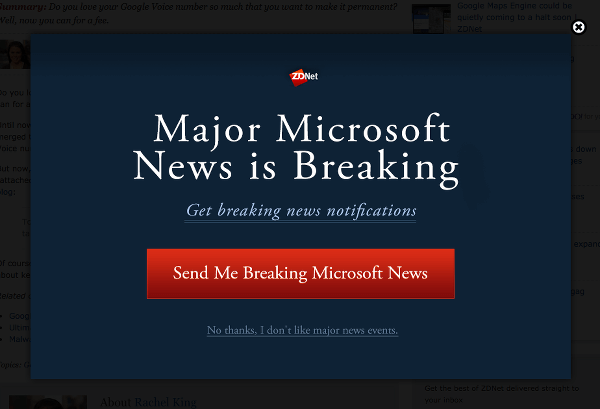 Yes, unsolicited modal windows are preferable to popups. But for the reasons discussed above, they’re still extremely problematic.